This continuing education course with exam is a visual guide to 86 stretches for increasing range of motion, muscular strength, stamina, posture, and flexibility. The 110 full-color anatomical illustrations highlight the primary muscles and surrounding structures engaged. The Stretching Anatomy, Second Edition continuing education course shows how to increase range of motion, supplement training, enhance recovery, and maximize efficiency of movement. It’s like having an X-ray of each stretch, only better. Not only do you see full-color illustrations of the muscles in action, but you also see how a change in position can alter the muscle emphasis and difficulty and how variations can improve safety and effectiveness. The Stretch Focus section details the technique and benefits of every exercise as well as safety considerations and variations according to skill level. Each exercise describes how to stretch, when to stretch, primary and secondary muscle emphasis, and which muscles are activated for support. Stretching programs provide three levels of difficulty, including light stretching that can be used to aid in recovery from soreness and injury. A chapter on dynamic stretches covers the most effective exercises for athletic warm-ups, while another chapter shows you how to customize a program based on your clients’ individual needs, including a program of passive static stretches proven to help lower blood glucose. 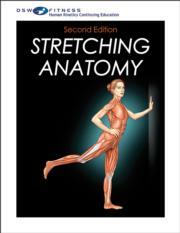 Whether your clients seek increased flexibility, better athletic performance, or reduced muscle soreness and tension, Stretching Anatomy, Second Edition, ensures proper stretching technique. The study guide contains a course syllabus, chapter activities, and end-of-chapter learning activities to prepare you for the 25-question continuing education exam at the conclusion of the course. Arnold G. Nelson, PhD, is a professor in the School of Kinesiology at Louisiana State University. A leading researcher on flexibility, he is considered one of the top authorities on the effect of stretching on muscle performance. Nelson is a fellow of the American College of Sports Medicine and earned his PhD in muscle physiology from the University of Texas at Austin. He resides in Baton Rouge, Louisiana. Jouko Kokkonen, PhD, is a professor of exercise science at Brigham Young University in Hawaii. For more than two decades he has taught anatomy, kinesiology, exercise physiology, and athletic conditioning; for more than three decades he has coached track and field. Kokkonen’s research has focused on the acute and chronic effects of stretching. He earned his PhD in exercise physiology from Brigham Young University and now resides in Laie, Hawaii, with his wife, Ruthanne.